NETWORK FINALS: CRAZY EX-GIRLFRIEND gained 0.1 in final numbers. CABLE HIGHLIGHTS: ESPN’s NBA doubleheader led Friday cable at 0.73/0.71, and the TOP RANK BOXING lead-out was at 0.36. 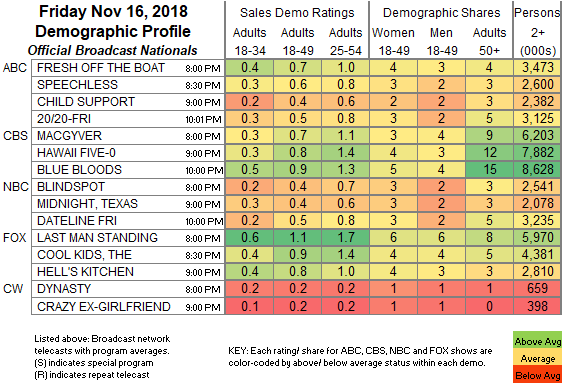 A&E’s LIVE PD climbed 0.09 to 0.70, and the clip-show lead-in was up 0.06 to 0.37. Discovery’s GOLD RUSH ticked down to 0.58, and MASTER OF ARMS was steady at 0.26. Nickelodeon’s noon PAW PATROL was at 0.30. MSNBC’s RACHEL MADDOW SHOW led cable news at 0.30/0.41/3M, with Fox News’s TUCKER CARLSON TONIGHT at 0.24/0.44/2.7M, and CNN TONIGHT at 0.23/0.28/1.1M. HGTV’s MY LOTTERY DREAM HOUSE slipped 0.02 to 0.28, HOUSE HUNTERS lost 0.04 to 0.23, and HOUSE HUNTERS INTL ticked down to 0.22. On HBO, REAL TIME WITH BILL MAHER dropped 0.07 to 0.28, and ROOM 104 was at 0.04/220K and 0.03/179K, compared to last week’s 0.06/0.05. 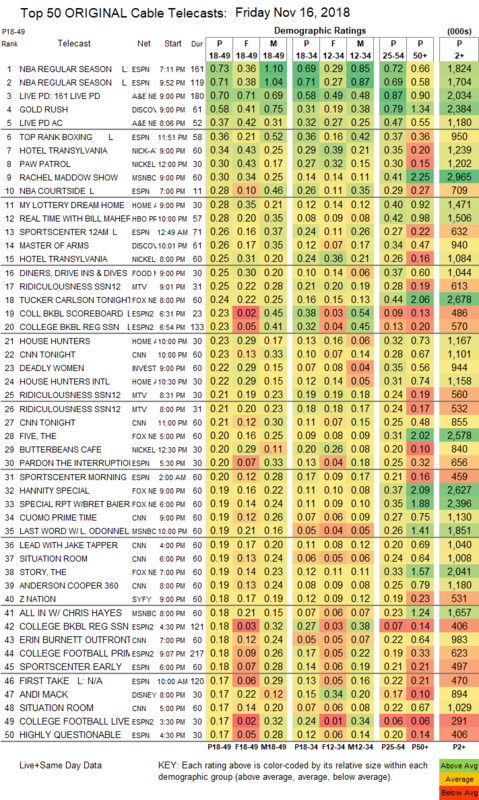 Food Network’s DINERS, DRIVE-INS & DIVES was at 0.25/0.24, steady with last week. MV’s RIDICULOUSNESS was at 0.25/0.21/0.21, compared to last week’s 0.30/0.26, and TOO STUPID TO DIE was up 0.03 to 0.16. ID’s DEADLY WOMEN dropped a tick to 0.22. On Syfy, Z NATION rose 0.06 to 0.18, and VAN HELSING was up 0.04 to 0.12. Paramount’s BELLATOR LIVE was at 0.13. On We, MARRIAGE BOOT CAMP fell 0.09 to 0.09. On Bravo, SWEET HOME was at 0.09, BUYING IT BLIND was at 0.07, and GET A ROOM was at 0.07.